Firefox today announced that the latest version of its web browsing software -- which it's calling "Firefox Quantum" instead of "Firefox 57" -- will be available as an update for users beginning November 14, with a beta of the browser hitting iOS, Android, and desktop today. The company said that the biggest advantage of Quantum is its speed, which is twice as fast as Firefox 52 when measured using Speedometer 2.0, a benchmark that simulates modern web applications. Firefox said that Quantum takes advantage of multiple CPU cores offered by today's desktop and mobile devices, instead of running on just one core, resulting in a "dramatically faster" web browser. The company updated a few other features so that Quantum runs smoothly, including making sure that the tab open on the browser downloads and runs prior to other tabs in the background. When compared to Chrome -- which Firefox directly compared itself to in a new video -- Quantum is said to be faster than Google's browser, "while consuming roughly 30 percent less RAM." The user experience of Quantum has also been overhauled and enhanced through the company's Photon project, which tasked Firefox's design team to research and understand "how users perceive web browsers." The team's findings have resulted in a more "modern" design that's built for "task focused" users. Quantum also comes with more direct integration with read-it-later app Pocket, which Mozilla acquired last year. The new, minimalist design introduces square tabs, smooth animations, and a Library, which provides quick access to your saved stuff: bookmarks, Pocket, history, downloads, tabs, and screenshots. Firefox Quantum feels right at home with today’s mouse and touch-driven operating systems: Windows 10, macOS High Sierra, Android Oreo, and iOS 11. Quantum will also continue to support Firefox's "Tracking Protection" privacy technology, which the company found to mitigate invasive tracking of online activity throughout various studies. Specifically, Firefox's technology demonstrated a 67.5 percent reduction in the number of cookies set to a user's browsing habits during a visit to 200 websites. These improvements also allow for performance enhancements, according to Firefox, reducing page load times by as much as 44 percent and lowering mobile data usage by 39 percent on the sites visited in the study. 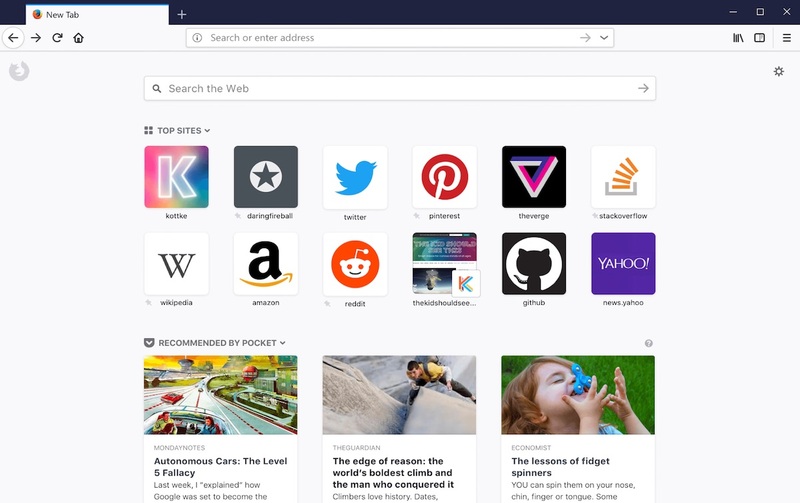 Firefox encourages users to sign up to be notified regarding news about the new Quantum browser, which can be done on the company's website right here. Ahead of the November 14 public launch, developers can also download the Firefox Quantum: Developer Edition starting today. Good news, Firefox has needed an overhaul for a while now. I don’t know why one would run any browser other than Safari on a Mac, especially a laptop or other mobile device. I’m certain that 90+% of users’ needs would be met by Safari, and Safari sips energy and contributes to increased battery life. Furthermore, the small percentage of users who run Chrome or Firefox out of necessity aren’t likely to change their habits for relatively small speed bumps and/or efficiency gains. Superior speed, efficiency, cloud integration, and aesthetics are my reasons for running Safari and I don’t anticipate that changing any time soon. Even if a browser surpasses Safari in any one of those categories, no other browser is as good at all of them. I just tried the beta and run the speedometer thing from the article. Firefox Quantum was slowest, Safari fastest, and Chrome came in between. Nice marketing buzzword tie in to quantum computing. I've been running the Developer edition for the past week - noticeably faster and better in ever regard. Too little, too late. Going to take more than this to dislodge the leaders (Safari on iOS, Chrome everywhere else). But it's good that Mozilla's still giving it a shot. It probably was always too late, given Safari is the default browser on iOS and macOS and Chrome is the default browser on Android and Chromebook. However, I really like Firefox as the second browser. It's considerably less resource intensive than Chrome and looks more native. Did they have to bully fire any CEOs to release this one? I don't get it either. Chrome uses like 5-10X the energy while idle, and it uses such a ridiculous amount of RAM that, with enough tabs open, your memory compression and/or disk paging will kick in and destroy your battery even more. I wonder if people don't even try Safari.